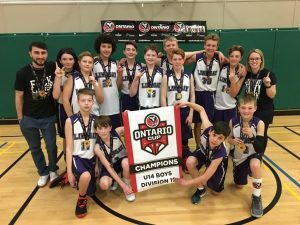 The Lindsay Wildcats U14 Major Bantam Boys took on all comers, and came away undefeated, capturing the Gold at the Ontario Cup Division Championships in London. With a strong defensive presence, and a collective determination, the boys posted victories over Port Colborne (38-34), Kirkland Lake (43-35), Guelph (47-34), and Timmins (71-50) in the round -robin, before taking Port Colborne in the medal game 46-40. Congratulations to the players and coaches on a job well done, in their first season!!! WAY TO GO WILDCATS!! !